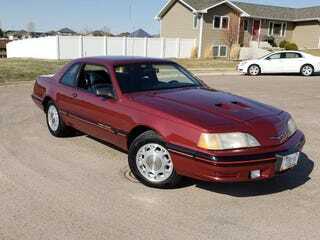 Up for sale is a very clean, well-cared for 1987 Ford Thunderbird Turbo Coupe with 116,+++ miles. These cars are getting harder to find, especially in this kind of condition. “Turbo” as we like to call her, is well equipped with modern factory options such as power windows/locks/seat/AC. She also has some not-so typical factory options such as auto adjust suspension with the ability to set it firm for tighter handling. There’s also an option for increased horsepower if you fill her up with premium and flip a switch. All this ads some great character to an already fun car. The turbo powered engine puts out plenty of power, and the 5 speed manual transmission is still tight and shifts very well. No rips/tears/holes in the interior, the tires are in great shape, and the body still shines, showing NO rust or evidence of any body work. Underneath is just as clean, and there are no leaks to speak of. I bought this car from the second owner, and it’s spent its entire life here locally in MT (see original sales receipt). Truly an amazing car that is sure to impress. There are just a few dents/scratches, but all in all a great driver that is quickly becoming a classic. Email, or call for more information (home phone only, NO texts). Please leave a message and I will call you as soon as I can. No calls after 10pm. If you email, please include the town in which you live so I know you’re not a scammer, otherwise I will not respond.